← Marking a Milestone: Fab 6 is Here! The problem: The demand for storage just keeps growing, and floating gate technology has hit the proverbial wall. A competitive, high-density storage solution to replace it is needed. 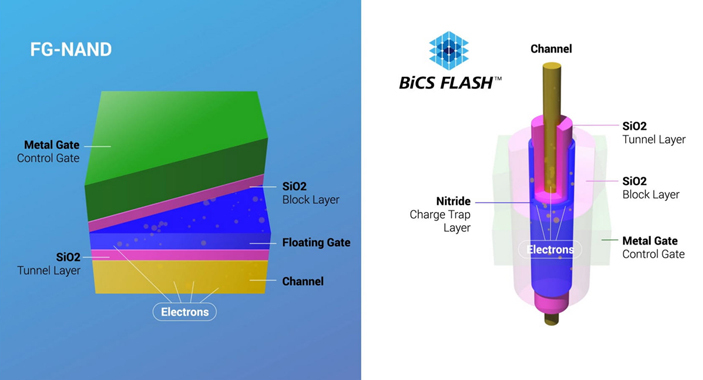 The solution: Our BiCS FLASHTM 3D flash memory. Toshiba was a pioneer of 3D flash memory – back in 2007, we were the first to present the concept. A number of other ‘firsts’ have followed, and we’re now up to 96 layers and on the fourth generation of BiCS FLASH. The latest installment in our Memory Design Insights Series of videos takes a deeper look at the role we have played up until now – and highlights our continued commitment to remaining in front of the pack. The future of flash memory is here – and it’s all about 3D. Notes: BiCS FLASH is a trademark of Toshiba Memory Corporation. Toshiba was a pioneer of 3D flash memory – back in 2007, we were the first to present the concept.